It is possible to add updates to your Whydonate page. This way you can keep all visitors of the page informed of the progress of your fundraiser. The update can consist of text, images and video. By clicking on the update tab you can immediately create a new update. 1. Login and go to your dashboard. 2. Click on the &apos;Fundraiser&apos; tab followed by the &apos;Edit&apos; icon. 3. 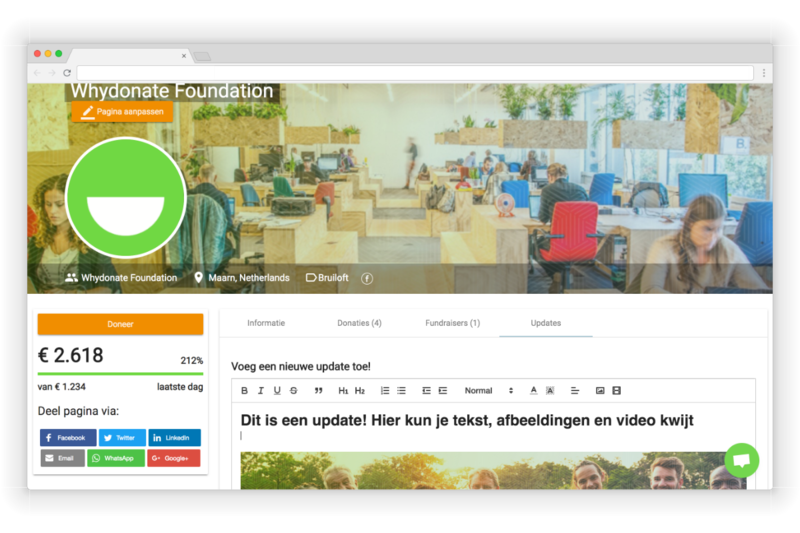 Click on the &apos;Updates&apos; tab from your fundraiser, you can now add the update to the text editor. 4. If you are satisfied with the update, click on &apos;Save&apos;. The update is immediately visible to everyone who visits your fundraiser.